Arrival at leh airport and transfer to hotel. complete day for rest and leisure to acclimatize. evening visit leh market & shanti stupa. overnight at hotel in leh. After an early breakfast we drive to nubra valley crossing khardung-la-pass - the highest motorable road in the world at 18,380 ft. nubra valley is popularly known as ldorma or the valley of flowers. it is situated to the north of ladakh between the karakoram and ladakhranges of the himalayas. check in at the resort and later visit the samstaling monastery. enjoy your evening at the campsite. · Meals in Air / train journey. · Personal Expenses like Shopping, Tips & Extra Food other than Tour. · Any emergency arising out of natural or political disturbance. · Cost Incidental to any change in the itinerary/stay on account of Flight or Train Ticket Cancellation due to Bad Weather, ill health, roadblocks & any factors beyond control. Nil refund for cancellation within 7 days prior to the tour date. Most of Ladakh is at an altitude of more than 3000m so you need to get acclimatized before you can set out to travel. Your body needs to adapt to high altitude, as the higher you go, the air becomes rarified and the oxygen available for you to breathe becomes lesser. Even though your body is capable of adapting to 'thin air', you need to give it time to do so. This is what is called acclimatization. Complete rest at the hotel to acclimatize to the high altitude region of Ladakh Take short steps and stop if you are breathless. You may not be able to walk here like you do it back home Always carry warm clothes while travelling, because weather in the mountains can change any minute Do not venture out on the first day. It is advisable not to take bath or shower on the first day as you might catch cold due to the exposure. So, keep warm and cozy on first day and avoid bathing. Please do not consume alcohol for the initial 2 days or your arrival in Leh Smokers should avoid smoking on the day of arrival Do not spend more than 10 minutes at high altitudes of Khardungla and Changla passes. We recommend Diamox medicine to counter the effects of Acute Mountain Sickness. (PLEASE CONSULT A DOCTOR) before you start your course. 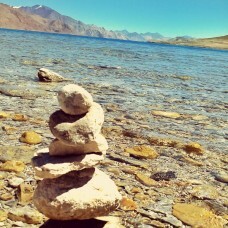 When travelling to Nubra and Pangong for overnight stays, you need not carry your entire luggage with you. Please pack essential items and warm clothing and leave your baggage packed in the rooms itself. The hotel staff will shift your luggage if rooms are required and keep it in the cloak room. You can identify your baggage on arrival and take it to your rooms. Note: Hotels may not be able to give you the same rooms on your 2 and 3 visit. Heating will not be available at hotels Hotels / Camps provide hot water from 6-8 AM and 6-8 PM only Hotels shut the main gates at 11 PM Leh and remote areas have regular power outages. Don’t expect 24hrs electricity. Extra bed at hotels will be mattresses Vehicle provided will be as per the itinerary and not at disposal. Airport transfers will be organized in Maruti Vans / Eeco. Transportation on a 'seat in coach' basis, where the coach departures are at fixed times and routes All fixed departures are Group tours on SIC basis in either Tempo Traveller (10 Seater) OR Innova / Xylo / Aria (6 Seater) All guests are requested to abide by the pickup time as displayed in the itinerary and wait at the reception. The vehicle will wait for a maximum period of 10 minutes only failing which the vehicle will leave the hotel without the guest. Seating in the vehicle will be on a rotational basis and all guests are requested to cooperate for a comfortable journey. Anything not mentioned in the itinerary can be provided at an additional cost. Any changes to the Itinerary or stay options in the event of ill health, road blocks, bad weather or any dangerous situation – Resulting in extra day / night stay or meals will have to be borne directly by the guests in cash at Leh. In case of flight cancellations due to bad weather or technical snags, we will assist the guests to book hotels, but the guests will have to pay directly to the hotel or the local agent in cash for this service. People with Heart disease / High BP / Obesity / Cervical and Spine problems / pregnant women are advised not to travel to Leh as they will face health problems while travelling. Travelers must undertake the journey at their own risk.